Account creation, or “sign up”, is vital to many web businesses - yet it’s a pain for most web users. Here’s 9, 12, 17, 19 ways to simplify your sign up process and make it more user-friendly. Most people have endless user names and frankly can’t remember which user name goes to what site. However, most people have just one, or perhaps a few, email addresses. So instead of having a username, simply use your users’ email as account sign in. But remember to always allow the user to edit his email address at a later point. One less form field during sign-up, and a lot less users forgetting their “username”. Easier sign-up and easier sign-in. Note: if you for some reason need a username, then at least allow “special characters” in it so people can use their email address if they want. Instead of disallowing weak passwords, inform your users and then let them make the decision. Most people have a couple of standard passwords they reuse, and there’s a chance it won’t fit if you require passwords to include either a number, a capital letter or be at least X characters long. If security is a concern then have a password strength indicator that warns the user when the password isn’t all that secure - then it’s up to the user to judge if the extra security is worth the hassle of creating a unique password just for your site. Note: there’s obviously exceptions where requiring a strong password is the right thing to do, such as websites that deal with private information or monetary transactions (e.g. online banking). 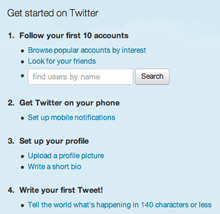 Twitter ask for additional information after you sign up so they can keep the sign-up form clean and simple. By asking your users for any non-vital information after sign-up, your sign-up form will be less intimidating and your users will get off their feet faster. Once users start seeing value in using your web app, they start seeing value in adding additional information to it. Account image, date of birth and country are rarely necessary to create a user account, so consider asking for this kind of information later on. Yahoo suggest alternative usernames if the one you want is already taken. Tell the user an account with this email already exists – don’t wait to do this until the form is submitted, do it live. Show a password field that will sign the user in with this email. Show a “do you want a new password sent to this email?” link. It’s very likely the user just forgot he already had an account. If you don’t use e-mail as account identifier, then suggest other related but available usernames. 5) Do I really have to type “fkr93pd”? CAPTCHA can be difficult to decipher and adds friction to your sign-up process. For most visitors a CAPTCHA can be difficult to decipher since the code often carry no meaning and is essentially an eye check and typing exam combined – so don’t use one unless it’s absolutely necessary. Make an A/B split test to see how much your conversion increase without the CAPTCHA and compare it to the actual amount of spam accounts created. Then make an informed decision based on this data. If you end up needing a CAPTCHA then at least have a look at these 6 CAPTCHA usability tips. An activation e-mail adds unnecessary friction to the sign-up process. The reason your users create an account is probably because you required them to so in order to do/view/get whatever - so give it to them instantly after they signed up. Don’t require them to sign-in to the account they just created. Oh, and do you truly need me to activate my account? Make the welcome e-mail easy to find so people can search for it. It’s inevitable that some of your users will forget their password, so make sure your welcome email (containing both username and a password reset feature) is easy to find later on. You can do this by having a proper e-mail subject like “Your [app name] account details” instead of things like “Welcome” or “Your new account”. Also, make sure the “from address” has you business name or URL as the nametag, and isn’t a cryptic mail server name. Facebook puts their sign-up form right on the home page. Your sign-up form shouldn’t consist of much more than 2-3 form fields and a button, so if sign-up is the main goal of your marketing site, then there’s no reason to create a separate page for this. Instead show the sign-up form directly on the home page. When you place your sign-up form on another page, you make the user consider abandonment before she even had a chance to see just how easy it is to sign up for your web app. Sun lures users in with the promise of single-sign-on for their entire site. Nobody likes creating yet another user account, so at least give your users a couple of reasons – why should they sign up? What are the benefits? The more friction there is, the more important this becomes. Do you know other tips to simplify the sign-up experience? Then share them in a comment. Authored by Christian Holst. Published on January 31, 2011. 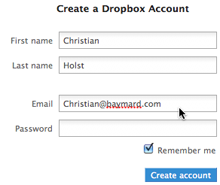 10) Use the same form for sign-up and logon (added by Ben Strovold). Use the same form for signup and logon. Just ask for an email address and then display the appropriate fields (eg. password or minimal signup info). Instapaper gets this right. 11) Account creation form with only one field (added by jcubic). Account creating form only with one field “email” and new random password could be send to this email with automatic link to account settings (this can be handled by create unique token for the user and put it in url) where user can change the password and set other fields like user name etc. It should always point to settings, so user can change their password if they forget it. I wish it became the standard for the vast majority of websites a long time ago, except for those that could benefit from the added security of a new user/password combination (financial sites, for instance). I’m not interested with your holidays! Tell me you require a certain password format (e.g. mix of letters and numbers) right on the sign-up form not in an error message after I’ve chosen a password. By telling me up front you’ll also lessen the number of times I forget my password since I won’t have to fight with my brain to remember the password you forced me into rather than the one I chose initially. By lowering the barrier to remembering my account details, you increase the chances I’ll come back to your site. Another option is to favor new users in the design giving registering more emphasis than signing-in. This makes signing-in more difficult than it could be but works on the assumption that you’ll work it out the first time and then understand how to do it. You’re more likely to lose a new customer than an existing one when you add points of friction. You could skip the “repeat password input” and just use an input that shows the actual password as you type it in. One less field in the form. For the users that need the discretion you could always have an option box next to the password input field for toggling its input type. If you would like to know the location of the user, but don’t need an exact address (say.. To give to a territory manager), use a service that can get the location from the IP address. 90% as effective and removes 1 to 5 fields over asking for address, zip or country. Obviously less fields increases signup. If the user submits a form and it returns an error, don’t make them retype everything! Nothing makes users leave your form faster than having to fill out everything again, because there was a minor problem with the data. allow the user to user the password he prefers. My point with the password strength indicator was to merely tell the user that the password was weak, not to force him to pick another. See, I don’t completely agree with that. If the password is at least medium strength I would tend to agree, But, if the password the user normally uses is far to weak, then it is your responsibility as the site owner to not allow it. That is to protect both you (and your site) and the user’s account as well. Users may not like having to pick stronger passwords, but having such weak passwords is one of the reasons sites get compromised. Even if a password is deemed weak, it can easily be strengthened by simply changing things like an “s” to a 5 or an “o” to a zero (0), and also using mixed case. That way, even if they are using their same password, it is strengthened by the slight changes suggested above. If they change ‘s’ to ‘5’ it’s no longer the same password and the whole idea of the customer easily being able to remember his password falls apart. For some sites that needs the extra security (banking, ecommerce sites with credit card stored), you’re right, don’t allow a weak password. For other sites you have to evaluate whether adding more friction for every single user both during ‘sign up’, and at every single ‘sign in’, is worth the extra security. E.g. if you’ve have data-logs suggesting there are many attempts to breach your security, it’s likely worth it – but make the assessment, what’s the consequences? I’m curious what type of website doesn’t need “extra security” and is there even such a thing? A compromised ‘personal blog’ site is a potential serious security breach for any ISP. Frankly, any site administrator who doesn’t take security more seriously is asking for trouble. Marketing departments should not govern security policies and that’s exactly what your #2 recommendation suggests. BTW, changing an ‘s’ to a ‘5’ adds rudimentary “strength” at best. As site administrators continue to encourage users to reuse weak passwords the entire web continues to be an unsecure place that ultimately serves no one’s business needs. Most of the web apps kind of assume there is one person behind an account (based on email address). If on a web app if a user can have multiple profiles then a username metaphor would fit better. Just wanted to point that out. I would not recommend including a plain-text password, especially one they “use for everything” in their welcome email. email is not terribly secure and it’s not good to leave records of credentials sitting around. Best practice is to provide a reset password function and never store the unencrypted password anywhere or send it to the user. How would you reset a password if you can’t send it to the user’s email? “Security questions” are not an option. By sending a “click here to reset your password” link to the users email, that will sign him in and take him to a form where he can type a new password. Assuming someone gets access to your email account, it has no relevance if your password is in plain-text or you have a password reset link. They can just request a new password and get a reset link (usual method) on the email account they had broken into. To counter this you would probably need a security question to be able to reset the password, the answer to which can not easily be guessed/researched. This kind of doubles as a second password which you don’t use very often and so you are very likely to forget it (happened to me) unless it’s something very obvious or very personal and also stable. I found a page discussing security questions so I won’t list my concerns here but I think password reset options also deserve some thought as they are directly linked to sign-in/sign-up. I’d add: use the same form for signup and logon. Just ask for an email address and then display the appropriate fields (eg. password or minimal signup info). Unlike others, including examples sighted in this article, Instapaper gets this right… and it’s ux is much better for it. But according to security ‘experts’ you are not supposed to reveal if an email is registered or not. By doing this, you are allowing anyone to find out if a certain email is registered. It’s a really good list, all obvious but I think we often forget the obvious, so those things are normally the most important to remind people! I would agree with Jacob that you should never put the password in the welcome email, it is not secure and certainly not if you are suggesting allowing them to use the same email they use elsewhere. The forgotten password is something people are used to and if you have used there email address as a user name then it is easy to get. If the email is typed wrong then how will you send the “activation email” to the right email address? I guess the fact that you cannot ‘activate’ you account since you did not received the activation email will get you back to the registration process. As opposed to being able to login straight away, interact with the service and then, a few weeks later when you’ll forget it, there’s now way to recover your password (meaning you lost all the work/relationships/time) you built in using the service. It’s easy to keep the session open, if you haven’t received the email straight away you may use a re-send link/button forcing to re-check (re-introduce) the email. I can see how they might be more useful for some types web applications/accounts than others. In the end it’s a matter of how much sign-up friction you want to add for every single of your new users (log-in to email, wait for activation mail, possibility of being marked as spam, click link, back to website) versus how good/bad an experience you want to provide for the users that mistype their email during sign-up. I’d rather lose some users not willing to use, a quite spread and common confirmation email, to have to deal with users completely cut off from their accounts. I might be a bit too narrowly focused on this one as I’ve just worked with a social gaming site (unnamed) where we discovered around 12% never clicked the activation link. Some of the abandonments are likely from users who sign-up from another computer than their primary and don’t have webmail/can’t access their mail at the sign-up moment. I suspect the activation link abandonment rate is normally lower on more “serious” applications, but for them the tradeoff was a no-brainer. For more serious web application I certainly follow your point, but I still think everyone should measure their “activation link” abandonment rate, and then make an informed decision about whether it’s worth to keep or not. But what if I typed wrong email address or make mistake on typing email address? When I just one time can do something on application, the second time when I come back I will need to register another account? True. Again, measure your “activity link” abandonment rate and then make a business assessment which is worse. I’m not telling you to ditch it in every single case, I just want you to consider what’s best for year overall business. For some “activation links” are, for others they aren’t. I think it is important to send an account activation link to the user’s email account right after sign up. I know this article says not to, but if the email address for the user is incorrect from the start, there is no way for the company to contact the user or reset their account. A much more fun way to cover some of the same topics. Thanks for sharing. I have got one : a experimental method to visualy recognize you entered the right password without disclose it. Great to see somebody experimenting with the password form fields. The koncept might work well, but in the current implementation it’s a bit hard to see the graph if the password field has a more “normal” size (compared to the demo one). Great idea! especially on sites where sign-up friction is key (e.g. if they need to use the app before even understanding it’s benefits – e.g. a game or social media extension). The obvious drawback is of course that every user will have to change his password, and the ones that don’t do it to begin with will likely try with their standard password the next time they sign-in. Don’t make me sign in every time I visit the site. Just keep me signed in for 2 weeks like on Yahoo. Great tip for signing-in. There will be an article about reducing sign-in friction within a week or two, I’ll be sure to include it. Is there any particular reason you didn’t mention it? I have never implemented it on a real website so don’t know if it’s significantly harder when compared to the more traditional approach. As others mentioned above, OpenID & OAuth (Twitter, Facebook, and more..) sign-up is crucial at least for a couple of sites (banking sites excluded). Good article, thanks. Just one question: what are the pros/cons of using eg facebook connect/linked in? This should speed up the registration process. However I am not sure what it means wrt ownership of user registration data. Thanks. That’s a really good one. I would only add to this that regular password fields have an autocomplete=“off” option which prevents password autocompletion. I have seen this implemented in phpmyadmin which I use every day and annoys the hell out of me. I use a very long mixed case + numerals password and it’s a pain to type it in every time when my browser knows my password. With regards to an online store. Instead of requiring account creating before check out. Have an option to use the included information to create an account. In a previous shopping card I worked on, we simply had a check box for ‘create account’ and if checked it opened a div ti add the password. Then the user doesn’t need to step out of the checkout funnel, or enter the information more then once. If you goto a login page and type your email address or username in and realize that you’ve forgotton your password. When you click the ‘forgot password’ link and it takes you to the next page, the website should automatically move the email address or username that you’ve already typed in to the next page. Again, great tip for signing-in. There will be an article about reducing sign-in friction within a week, I’ll try to include it there. Thanks. I’d recommend being very careful about using the same form for sign-in as registering. It’s very easy to create a confusing page that acts as a virtual brick wall for new users. If you’re going to do this try including the question “Do you have an account already?” in the way that Ebay does. Another option is to favour new users in the design giving registering more emphasis than signing-in. This makes signing-in more difficult than it could be but works on the assumption that you’ll work it out the first time and then understand how to do it. You’re more likely to lose a new customer than an existing one when you add points of friction. They had this on an online browser game I used to play. They made it easy to sign up by saving a single click for the first time user but they made it harder for a few hundred thousand daily users to sign in by making them do that extra click. This coupled with an autocomplete=“off” password field and several logins daily made it one of the most annoying sites to log into ever. That would make it a bit annoying to change if you noticed you’d typed it wrong. c) in your script check if the default value was altered. Spam-Bots will fill out all fields and are not capable of understanding CSS. Who ever fills that out is a bot…. Decouple the email address used for username and the email address used to make password resets. By default, make the latter the same as the former via a checked “use same email for password recovery”. This is as I may lose access to that email and my password to your website. Another important thing when the users have to enter data: show clearly the data-entry format. Some sign-up forms are a nightmare when you have to write dates, phone numbers or zip codes. Please, don’t. The reason to ask the password twice is to make sure the user KNOWS the password. I doesn’t matter if you echo the password on the screen or not, if you ask it only once, the user will mistype it, not see he mistyped because he skipped to the next field in a rush, finish his signup and be frustrated that he can’t login and say your app is broken. I’m all for using e-mail addresses as usernames in the sign up/sign in process, but please don’t use it as a unique identifier if that means that I can’t change my e-mail address later. Great addition to point #1. I’m a journalist learning dev skills. This is a simple, no nonsense post. Thank you for the great posting! I translated this post into Korean. The translation is posted on my blog. If you mind, i’ll remove the translation. Please reply me. Thank you. I don’t mind at all as you link back to the original. Disagree with the email address as a rule. It really depends on who is using your site and what they’re using it for. Some applications do not allow you to change your user name once you have signed up, and in those situations you should definitely avoid the use of email addresses. If you sign up at work, for instance, and then leave the job for another position you will end up having to use your old email address to sign in, or create a new account and lose the last account. It makes matters even worse when people use the email address as the user name and then don’t collect another email address. Probably doesn’t need to be take off the rules, but definitely should be considered carefully when putting together your registration package. They are all meant as guidelines, not rules. I think the solution here is simple: always allow the user to change the email address after they’ve signed up, as CKN also mentions. Don’t ask for information that you can obtain other ways. If you would like to know the location of the user, but don’t need an exact address (say.. To give to a territory manager), use a service that can get the location from the IP address. 90% as effective and removes 1 to 5 fields over asking for address, zip or country. Obviously less fields increases signup. Prefect, thanks Dave. I’ve added it to the list. Spread your signup process out as much as possible; have just a user/pass field, then ask for the email address on the next page. Asking for less info up-front is less intimidating, and once they are committed (already typed in a user and pass) they are less likely to bail when you just want one more bit .. I never use capthas in the regular sense – they visually ugly, intrusive and just plain annoying. Dont require logins/accounts unless absolutely necessary. in some countries the email activation is required by law including the US. I’m more hardous. email WON’T be mandatory !! Email is not certified. We make him overconfident. Email is just a notification system like another. A trust him too let make very sever security protection on your application but forget that you delegate your security to an out of control security system. (best way to hack a lot of account is to hack the mail box, scan account reminder and welcome in archive, run a “reset password on the fetched list and take over the accounts”. Don’t belive in mails ! Here’s an idea: integrate logins and signups using Facebook, Twitter, LinkedIn, etc. Research proves that conversion rates go way up when using these popular services. Here’s one more idea: if the user submits a form and it returns an error, don’t make them retype in everything! Nothing makes users leave your form faster than having to fill out everything again, because there was a minor problem with the data. Thanks for sharing Jeffrey. I’ve added it to the list. Everything on here is relevant and after reading the comments, – I agree with Jeffrey, don’t make me retype everything. It’s intensely annoying – especially when it doesn’t tell me exactly where the error is. The password thing is so annoying! It just forces mainstream users to write down their passwords or never come back because they can’t remember their 6-10 letter password with one number, no symbols and one uppercase and lowercase letter. xkcd says it best: http://xkcd.com/936/. I strongly support OAuth. nearly all users have account in google, facebook, yahoo or microsoft and all them give us great API to work with so there is no need to create a new account for every individual site. I’m not sure if I have an account with the website. I go straight to recover password and they tell me if I do or do not have an account there. I just hate when they say “If you have an account with us, we’ll send you an e-mail with the password recovery.” And then you don’t know if the e-mail was sent or if it went straight to junk. Extra work for you. I know I have an account. My e-mail is my user. I try to login with some passwords that I use but all are wrong. I already typed my e-mail address as the login, but I have to type it again on a Password Reset form. Why? My e-mail is already there as my login! Use that! All what you mentioned have their pros and cons. for example captcha could be hard for some users to be decipher but it’s necessary for blocking spammers and bots. Even though it is old, it is a very useful article. However, I have some concerns. You say don’t ask email and password twice and you also say sign the user automatically. This means that if there is a misspelled email address, the activation link can be sent to a stranger who can click it and login automatically to the site. This is not blocking since your “real” email address is free to re-register with, however if you have entered additional profile information (e.g. demographics) there will be a security issue, since someone will be using the site with your email and personal information, but a different email address. Therefore, what is the best way (usable but also secure) to ask for account activation? Ask to retype email or ask to login after activating account?